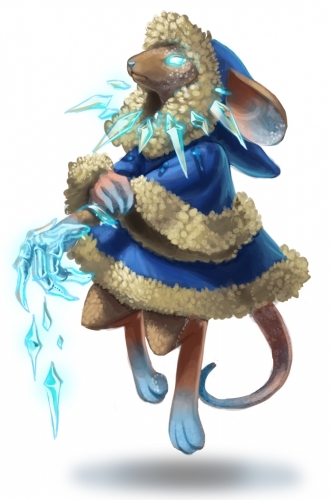 The Lady Coldsnap is a breed of mouse found in the General zones of the Iceberg. It is known to drop Bottled Cold Fusion, Hunting Research, Satchel of Gold, Sticky Charms, and Wax Charms as loot. To lead the Zealots into battle, Icewing sought out the greatest and wildest ice magic master mouse of our time, Lady Coldsnap. Her powerful ice magic is fueled by her rage, and she has been building her anger towards Gnawnia for quite some time. Lady Coldsnaps have no specific preference for any kind of cheese. The Lady Coldsnap drops the Icewing's Generals Egg during the annual Spring Egg Hunt. The Lady Coldsnaps were released on 24 May 2012 with the opening of the Iceberg location. They began to drop the additional research, gold and charm loot on 1 June 2012. This page was last edited on 22 May 2017, at 17:15.